UNITED NATIONS, United States — Russia on Wednesday vetoed a UN resolution demanding the Syrian government co-operate with an investigation of a suspected chemical attack, blocking Security Council action against its ally for an eighth time. Britain, France and the United States had put forward the measure in response to the suspected sarin gas attack in rebel-held Khan Sheikhun on April 4 that left 87 dead, including 31 children. The Russian veto came after US Secretary of State Rex Tillerson declared following talks in Moscow that there was a "low level of trust" between the United States and Russia. China, another veto-holding power at the council, abstained in the vote, as did Kazakhstan and Ethiopia. Bolivia voted against the measure and 10 other council members supported it. "With its veto, Russia said ’no’ to accountability, Russia said ’no’ to co-operation with the UN’s independent investigation and Russia said ’no’ to a resolution that would have helped to promote peace in Syria," said US Ambassador Nikki Haley. "The international community has spoken. Russia now has a lot to prove," she said. 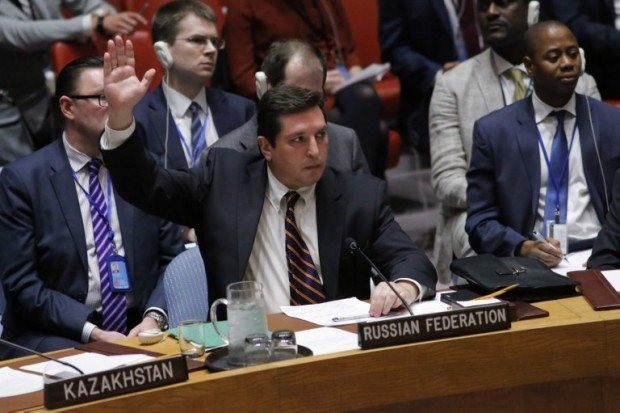 Russian Deputy Ambassador Vladimir Safronkov recalled that Moscow had "consistently expressed our categorical disagreement" with the draft resolution but that Western governments had insisted on a vote. The proposed resolution would have condemned the alleged attack and expressed the council’s full backing to investigators from the Organisation for the Prohibition of Chemical Weapons (OPCW). The draft would have demanded that the Syrian government provide flight plans, flight logs and other information on its military operations on April 4, hand over the names of commanders of any aircraft and provide access to air bases to UN investigators. The West has accused Assad’s forces of carrying out the attack in Idlib province that shocked the world. France and Britain expressed its dismay over the Russian veto. "This puts Russia on the wrong side of the argument," British Foreign Secretary Boris Johnson said in a statement in London. In Paris, French President Francois Hollande said "Russia bears a heavy responsibility" by systematically opposing multilateral action to protect its Syrian ally Assad. UN investigators already have the mandate under previous resolutions to look into allegations of chemical weapons use in Syria but the West had pushed for council resolution to underscore its support for a thorough investigation in the Khan Sheikhun case. "To Assad and the Syrian government: you have no friends in the world after your horrible actions," Haley said. "The days of your arrogance and disregard for humanity are over. Your excuses will no longer be heard. I suggest you look at this vote very carefully and heed this warning," she added. Russian Foreign Minister Sergei Lavrov said in Moscow following his talks with Tillerson that the OPCW should be allowed to carry out an "objective investigation". Russia presented a separate draft text condemning the US military strikes in Syria and requesting an OPCW investigation, but it was unclear whether that measure would come up for a vote.